An encounter with a shark. The team and I are currently in our final training camp before the big one. For me this has involved lots of time in courses and long days. Training varies depending on what training hill space is available. Generally we are on the hill for a long morning session which will take us into the afternoon then its lunch and off back to our apartments. Depending on how late the day is I will complete a recovery session at the apartment and if I have a few spare hours before dinner I will hit the gym for some weights work. Back home and it’s a video session from the days training, analysing the runs to identify strengths and weaknesses. Dinner is next on the priority and then it’s time to relax with the evening off. Evenings are usually spent doing odds and ends including packing and making lunch for the next day, checking emails etc. An early night to give the body some rest for the next day! Today however was an extraordinary day we arrived to the news from our coach that Greg Norman, one of Australia’s all time best athletes who several of the staff had spotted the day before would be joining us for a team photo and leisurely chat. What an honour! He promptly turned up as he had promised and spent 30 minutes with us chatting about everything from Vancouver to hunting at his ranch here in Colorado. For such a huge superstar he was amazingly down to earth and genuinely interested in our pursuits, a lovely man and a pleasure to have met! I may have left Australia nearly three months ago to commence my preparations (along with my guide Eric) for the 2010 Vancouver Paralympic Games and only now have I found enough time to set up this blog to keep you all updated with my adventures towards Vancouver. So I will try keep this brief but since I left Australia November 27 things have been well... hectic to say the least! I arrived in Colorado where I spent four weeks with the rest of the Australian Paralympic Team training and racing before it was onto Switzerland, Austria, Italy, France, and Spain for more training and races including my debut on the World Cup circuit in Slalom. 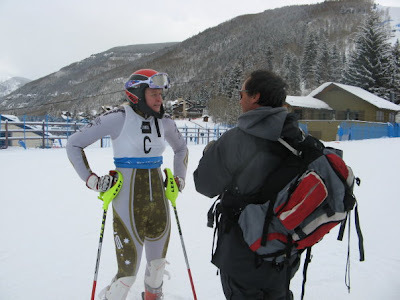 Prior to my World Cup debut in Austria I had only competed in two Slalom races, my first ever race and my first International win at the New Zealand Winter Games and another first place in the North American races at Copper Mountain in Colorado. Our first World Cup experience was a memorable one podiuming in our first appearance- a third place! In the process I also became the first Australian women to podium at an IPC World Cup event not bad for a rookie! Over the next week we competed in three more Slalom World Cup races picking up a fifth, a fourth, and another podium, once again a third place. An extra bonus was winning third place in the World Cup Overall Slalom Title, a prestigious title awarded to the most successful and consistent performers over the race series. A very satisfying result considering I had now only competed in six Slalom races when we were competing against girls who have been racing for many years. It was then back to the US for a short break and now the team and I are in a heavy training block as the Games draw closer and closer! So far our season results have totalled three North American podiums (Slalom first, GS third, Super Combined third), two European Cup podiums (third Slalom, third Super Combined), two World Cup podiums (Slalom third x two) and third in the World Cup Overall Slalom Title. A good start with more to come!